Scan, serve & pack produce whilst shooting guns to defend your store from mutant fruit! 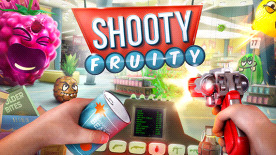 Shooty Fruity is a multi-tasking shooter only possible with a VR headset & motion control. Can you do your job as a sharpshooting shop clerk during the heat of combat? Take on new roles, unlock new weapons & blow up tons of fruit in your juicy career. Scan! Shoot! Repeat! New “shoot & serve” multi-tasking gameplay made especially for VR & motion control. Work through a whole career of roles & challenges, including checkout, canteen & more! Arm yourself with a customisable arsenal of fruit-killing guns, explosives & power-ups. Tons of vicious, nasty fruit! Unload high octane ammo into their ripe, fleshy bodies! ©nDreams. nDreams, the nDreams logo and Shooty Fruity are either registered trademarks or trademarks of nDreams Ltd. All rights reserved. Unreal, Unreal Engine, the circle-U logo and the Powered by Unreal Engine logo are trademarks or registered trademarks of Epic Games, Inc. in the United States and elsewhere.